Bukhar zhyrau, thanks to his valor and eloquence, became one of the most influential figures of his epoch, who deserved the popular nickname 'Komikei aulie'. This year marks the 350th anniversary of the birth of the outstanding Kazakh poet, statesman Bukhar zhyrau. Memories are important so that everyone, living in the present, thinks about the future, without forgetting the past. Bukhar zhyrau Kalkamanuly is a poet of the epic genre, the largest public figure of the times of the khans Tauke, Bolat, Abilmambet and Abylai. Until recently, this name was almost erased from the anthology of Kazakh poetry, and from national history for a long time. This name was subjected to default, or he was given an unforgivable generalized-condemning description for the sake of ideological stereotypes, calling him a feudal singer, more specifically, a court poet of Abylai khan. The creative heritage of Bukhar zhyrau has recently become an object of study, some of the poet's works are published in a few collections, including thirty-six tolgaus, according to which literary scholars and readers can judge the nature of the world outlook and the social orientation of the belief of one of the famous representatives complex era of the 17th and 18th centuries. Bukhar zhyrau was born in 1668 (according to other sources 1684, or even 1693) and grew up in the picturesque town near Bayanaul district of the Pavlodar region. As established by the chief researcher of his life and work, a scholar-folklorist, a collector of Bukhar, Mashhur Zhusup Kopeyev's works, he came from the genus Argyn of the Middle Zhuz, and his ancestors belonged to noble elders and ancestors. The father of Bukhar zhyrau - Kalkaman was a brave and courageous batyr of the Kazakh argyn tribe. Since childhood, Bukhar was of high potential. But one day, a seven-year-old boy, in the absence of his parents, who went to the funeral, was picked up by a tornado. Curled in a strange wind, the boy sang, and his song poured non-stop. When the wind died down, the deaf-mute did not only hear, but also spoke, and in verse. Of course, this early period of the poet's life is colored by a legendary halo, but he also convinces himself that in everyday life Bukhar spoke a poetic language. The keepers of the legends indicated that the Kazakh zhyrau were not just poets, eloquent and sharply speaking akin-speakers, but also bearers of sacral knowledge. They say that the gift of poetic improvisation was considered prophetic. Sacred knowledge, hidden from the eyes of an ordinary person, developed from pre-Biblical times and was contained in alchemy, astrology, semiotics, numerology, and so on. Zhyrau were subject to the mysteries of the world of minerals, the meaning of ancient symbols, they predicted the future according to the location of the stars, interpreted dreams, explained the natural phenomena, explained the signs, in one word played the role of the ordination. Since in the Kazakh poetry of the 16th - 17th centuries the dominant role was played by zhyrau, for in the nomadic society, eloquence was considered to be above all the arts, but zhyrau, due to the power of its poetic gift, exerted a definite influence on the masses. They were in the service of the rulers as advisors, they participated in campaigns, praised the heroes of battles, victories, lamented the death of the batyrs. The main form of oral historical tradition in the 18th century was the Kazakh tolgau - instructive song-thoughts in verse. Tolgau abounds with aphorisms, instructive precepts and winged words. Bukhar had a great poetic gift, and he was the adviser and mentor of the ruler Ablai; being literate, participated in the creation of various legal provisions. Many poems and their records have survived. Together with the biys - Kazbek, Aiteke, Tole, he participated in the drafting of the first Kazakh legal standard "Zhety zhargy" ("Seven Regulations" or "Laws of Tauke khan"), as well as in the decision of state affairs. Becoming a popular singer, during his lifetime Bukhar deserved the name "zhyrau", otherwise the singer-improviser giving wise advice. As a popular sage, he was a staunch supporter of justice, preached in a poetic way the ideas of good and truth, sang the beauty and power of nature, as well as her creations. Addressing his fellow tribesmen, he urged them: "Chant the beauty of nature", "Admire the universe - the creation of the all-powerful nature." Being the representative of the most prominent historical figures of the times of Abylai, whose creative heritage was preserved thanks to written shezhira: "Elder Bukhar zhyrau from the clan of Karzas was the son of Kalkaman batyr. Those who knew him called him "the sacred throat". Here it is appropriate to quote the testimony of the famous Russian scientist, a friend of Shokan Ualikhanov, Grigory Potanin. In the article by Potanin "In the yurt of the last Kirghiz (Kazakh) Tsarevich" there are some lines indicating Bukhar's significance. The high concept of poetic creativity was expressed by the Kazakhs in the legend of the origin of the song. The legend says that once, in those remote times when people could not sing yet, the song flew above the ground and sang. Where she flew low, people heard her well and took her songs. Where high, there were badly heard her songs, and the peoples inhabiting these lands, remained unmusical. Over the Kazakh steppe the song flew lower than over any other country, and therefore the Kazakhs are the best singers in the world. The famous figure of the Kazakh people was a very educated man for his time and worked in Arabic. From his poetic heritage to the present day has reached more than a thousand lines. Thanks to oral legends, they were collected and recorded during the 19th and 20th centuries and preserved in the archival funds of Almaty, Tashkent and Beijing, and perhaps the heritage of the akyn-sage is scattered over other archives in Arabic-speaking countries. So researchers will not remain without bread. In all matters, the Khan is truly judging. Death does not pass by anybody. In the sublunary world of rights one Allah. Let the Koran reveal the mullah. It's hard to start talking to the people. Being an eyewitness of the strong, free state of the Kazakhs under the Tauke khan, Bukhar zhyrau felt sorry for that as in only half a century the Kazakh Khanate began to disintegrate into separate parts run by foreign rulers. None of the predecessors, nor Bukhar's contemporaries, had the name of "Komikei aulie". This honorable name was awarded to him - to Bukhar zhyrau Kalmakanuly. The lifetime of Bukhar zhyrau coincided with the most important military milestones of the Kazakh Khanate, when the question of life or death was solved in the struggle against the Dzhungarian conquerors. The heroic pathos of Bulanty (1728) and a number of other battles brought to us the works of Bukhar zhyrau along with poetic legends Umbetai-zhyrau, Aktamberdy-zhyrau, akyna Kotesh and others. The names of the heroes Bogembai Akshauly, Olzhabay Alimuly, Batyr Bayan, Zharylgap and others became legendary during their lifetime. This is thanks to Bukhar zhyrau, a participant in the main events in the area of ​​Ichishpes Alakol, we know the details of the duel of twenty-year-old Sabalak (pseudonym of Abylai khan) in hand-to-hand combat with Oirat. Defeating his formidable opponent, Abylai eclipsed the other outstanding warriors with his courage and glorified himself forever. While Asan kaigy was an adviser to the first Kazakh khans of Zhanibek and Kerey, then for Abylai Khan this mission was performed by Bukhar zhyrau. It is difficult to overestimate the role of these two wise men-zhyrau: the first - as the ideologist of the creation of the Kazakh people and state, the second - as an adviser to Abylai Khan at a time when the issue of life and death of the Kazakh ethnos was being decided. Abylai Khan was able to become a unifier of the steppe aristocracy, and Bukhar zhyrau was the spokesman for the interests of broad sections of the people. Therefore, their mutual understanding and interaction played an important role in the fate of the Kazakhs at a crucial historical moment, when the Dzhungars occupied almost half of the Kazakh lands. In addition, both of the nomadic people, who were so close together in the spirit and way of life, were caught between the expansions of the Russian and Chinese empires. The dramatic nature of the situation exacerbated the fragmentation of the Kazakhs, the outrage of the personal interests of individual beks, sultans, clan and tribes over the nationwide task, which at that time was extremely clear and important-the preservation by the Kazakhs of their independence and solidarity as a people. Being an eyewitness of the strong, free state of the Kazakhs under Tauke khan, Bukhar zhyrau watched painfully as in only half a century the Kazakh Khanate began to disintegrate into separate parts that had come under the control of foreign rulers. Undoubtedly, the fact of the return of the lost lands of the Middle and Senior hordes became possible primarily due to the will and spirit of the Kazakh people, but this is also the credit of Abylai Khan who managed to show such personal qualities of the ruler as wisdom, diplomacy, and where necessary - courage, determination and talent of the commander. And Bukhar zhyrau, becoming his adviser, supported the khan in word and deed. The good thing is that the poet and storyteller, who had seen many things in his own time, had something to share with Abylai. Advisor and crier of Abylai khan's ideas Bukhar zhyrau became an ideological adviser to the khan in solving a particular issue in a specific situation. His image in the Kazakh Shezhire is the image of a just soothsayer, an active champion of the unity of the Kazakh people, and finally, a person who embodied the best features of that distant era. It is well known that Abylai Khan summoned Bukhar zhyrau before a major battle and asked to predict the outcome of the battle by the location of the moon and stars. Predicting the future and behavior of animals. So, according to zhyrau, if the yellow camel - the male approached the banner of the khan and, looking away, furiously raged, then the khan's army expected luck. If the animal lay down on the ground at the banner, it was worth refraining from the offensive. It is no coincidence that he became the most influential political figure and the main adviser to Abylai. The public and political prestige of Zhyrau was decent enough. He accompanied Abylai everywhere, he visited all adjacent regions bordering with Kazakh soil. Over the expanses of Kokshetau. From you in the steppe of your primordial. Do not belong to Kazakhs! We can not escape from the war! Considering the abstract and artistic orientation of Bukhar's poetry, it should be noted that it is contained in the truth, life, and also the realities of the then situation of the Kazakh Khanate. He saw Khan Ablai and his batyrs as ordinary people, criticized for vanity, excessive desire for glory, for omissions. One day Abylai decided to send an army to plunder a village of one bi for some relatively insignificant act. Khan was this time so inaccessible that no one dared to utter a word in favor of the guilty, then, at the request of the people, Bukhar the singer decided and said: 'Oh, Abylai, Abylai. Like a bright star, your glory rises and rivals the mountains, extinguish anger, if you extinguish anger, then the guilty himself will come with a bow and gifts.' After these words, the khan was forced to retreat. " Is there a difference between Bukhar zhyrau and other colleagues? Very large and special. Unlike many zhyrau previous centuries - Dospambet, and zhyrau - contemporaries of Akhmatberdi, Margaska, Zhienbet, Shalkiyiz, Umbitay, Tatar akyn, Kotesh akyn and Shal akyn, our hero shows a profound knowledge of the holy book of Muslims - the Koran, often in his works refers to the heroes of Islamic mythology. "Allah!" - Let the tongue speak. Let the boy and the old man speak. About how true and great Quran is! Bukhar zhyrau served Abylai khan. Shokan Ualikhanov in his research exemplifies the genre joqtau - farewell one of Bukhar's tolgau. One of the core themes of poetry Bukhar zhyrau remained the theme of love for the Motherland, patriotism, glorification of the heroes of the liberation struggle - batyrs. In the songs "Desire", "Oh, Abylai", "Death of a High Mountain" and a number of others in a poetic form, thoughts about human life and morality are set out. Despite the long years of neglect outstanding akin-improviser, statesman and diplomat, warrior and approximate, adviser and mentor reigning ruler, returned to the people of their creative ideas, creations of the poetic word. Proceedings of the national sage had just begun to study in depth, it is impossible to comprehensively assess, for many, as we said above, is sprayed on the archival collections, and what we have now is only nuggets of works of the poet. Even judging by the 36 tolgaus found by historians in the archives, we have the good fortune to learn the literary heritage of a remarkable man, a phenomenal bard, who gave an honor and respect for such authorities as Shokan Ualikhanov, Grigory Potanin and our contemporary Mashhur Zhussup Kopeev. He died in 1781 at the age of one hundred and thirteen-year-old patriarch. The ashes of the famous bard, the largest figure in the khans Tauke Bolat, Abulmambeta and Abylai lies in Bayanauyl at the foot of Dalby. Mashhur Zhusup Kopeev found the grave of zhyrau, the first to establish a sign over the tombstone. And in 1993, on the burial site, a mausoleum was erected, the author of which was the architect A.Saumenov. A monument has been erected in Karagandy, the post of Kazakhstan in 1993 issued a memorial stamp, and in many localities of Kazakhstan there were streets bearing the name of Bukhar zhyrau. 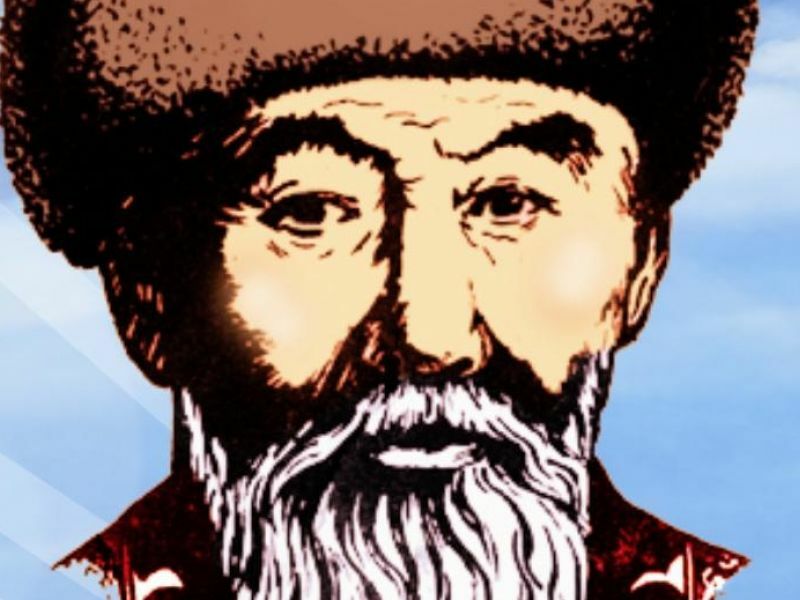 The events dedicated to the 350th anniversary of the statesman Bukhar zhyrau Kalkamanuly has been held in the Karaganda region throughout the year, but a holiday of the same scale as planned in Botakara has not yet taken place in the region. The event of different scale are held within the framework of the program article of the President Nursultan Nazarbayev "Rukhani zhangyru". All this, hopefully, will make it possible to tell more clearly about spiritual values and national traditions of Kazakhs. In addition, the history of the Kazakh people is clearly traced in the biography and work of Bukhar zhyrau.